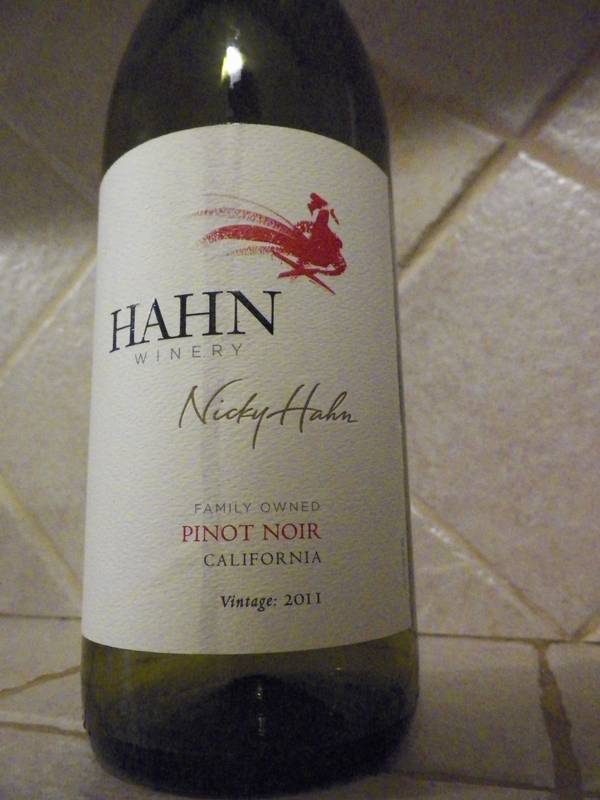 I had a great Pinot Noir the other day! It was recommended to me by the guy at Spec’s. I think it’s hard to get wine recommendations from other people. Wine is just a really personal choice! Everyone’s taste buds and likings are so different. I’ve taken recommendations from other spec’s employees before and it never works out this good. Y’all, this wine is so good. It is light and fresh from first taste. There is an oak-y-ness to it, but not very much at all. It finishes smooth and perfectly balanced. And it was only 10.00. I’m loving this wine. I hope you enjoy it too. During the month of January I’ve been really trying to eat better. I cut out sugar and all carbs. Well that lasted about 7 days! Then I added some carbs back in 🙂 Mostly, beans, nuts and legumes. I started doing the Slow Carb Challenge through Ashley Benson Fitness. It’s been great! It’s been hard too, but great! Have I ever told you I get hungry often? like really often? Even if I fill up really well at a meal, give me about 1-1.5 hours and I’m hungry! It’s crazy. I guess that’s a fast metabolism? Not sure. Either way, that leaves me cooking, snacking and eating a lot. Snacks are really hard for me. Before The Slow Carb Challenge, snacks usually involve some sort of carb, give-me-that-full-feeling, sort of food. It did make me feel full, but didn’t do my body any good … weight-wise or nutrient-wise. I’ve had to be really creative, and honestly, put in some time, to making healthy snacks that I enjoy. Over the next few weeks, I’m going to be blogging about my experiences with The Slow Carb Challenge: snacks I’ve learned to love, interesting dinners I’ve made, and things God is teaching me regarding eating. I hope you enjoy it! I love this recipe. It’s a Southern Living recipe. I’ve never gone wrong with any Southern Living recipe I’ve ever made! 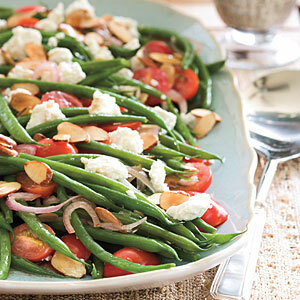 The green beans are perfectly cooked and perfectly paired with juicy tomatoes, toasted, crunchy almonds and goat cheese. YUMMY!!! It’s great with any dish, chicken, beef or fish. I hope you love it! 1. Preheat oven to 350°. Bake almonds in a single layer in a shallow pan 6 to 8 minutes or until lightly toasted and fragrant, stirring halfway through. 2. Cook green beans in boiling salted water to cover 6 to 8 minutes or until crisp-tender; drain. Plunge beans into ice water to stop the cooking process; drain. 3. Whisk together vinegar and next 3 ingredients in a large bowl; add olive oil in a slow, steady stream, whisking constantly until blended and smooth. Add cherry tomatoes, shallots, garlic, and green beans; toss to coat. 4. Top green bean mixture with crumbled goat cheese and toasted almonds. Any 2013 Goals or Resolutions?